Unlike the camcorder or DSLR (digital single lens reflex camera) you may be comfortable using, the GoPro offers far fewer controls. It handles most of the technical settings automatically, and the focal length is limited to a single angle of view (albeit very wide-angle). The Black Edition offers some variations by providing a narrow and medium angle of view. Basically, it shoots the scene at a higher resolution setting and crops it to fit the frame, so there is no loss of quality. The 2.7K mode provides enough resolution for the medium view; the 4K mode allows you to capture a narrower section. So when you’re on a lonely, desolate stretch of highway, a single-pump gas station has all that you need. A GoPro isn’t much different. The camera is simple to operate, leaving the creative stuff up to you. That “creative stuff” includes setting up the camera properly, arranging each shot effectively, and solving each problem that pops up. Every time something changes in the scene or you move the camera, it’s important to make adjustments. No adjustable aperture setting: The aperture setting determines the amount of light that goes into the lens. GoPro sets it automatically. With another camera, you might adjust the aperture setting to increase or decrease depth of the focus in a scene, but you don’t have that option when you’re working with an ultra-wide-angle lens. No adjustable shutter speed: Depending on the subject, lighting, and level of action, adjusting the shutter speed offers a little more control. Slow speeds produce blurred images; higher ones can capture crisp action. GoPro doesn’t allow you to change the shutter speed, but it does offer a wide range of frame rates, which you can adjust to achieve the same effects. No manual focus: You don’t have much to focus with a lens that covers a 170-degree angle of view. Just about anything in the scene is in focus as long as it’s more than a few inches away (see the figure). The GoPro isn’t a point-and-shoot camera. Although the camera’s manual controls are somewhat limited, it’s more than a point-and-shoot. Still, the term is misleading for referring to automatic cameras. Even the most expensive DSLR can be used in a fully automatic mode. So while GoPro limits your control over exposure and focal length, if it’s a point-and-shoot camera then it’s one on steroids. Great movies are always made by hand, so be more concerned with setting up the shot and less about the automatic stuff. 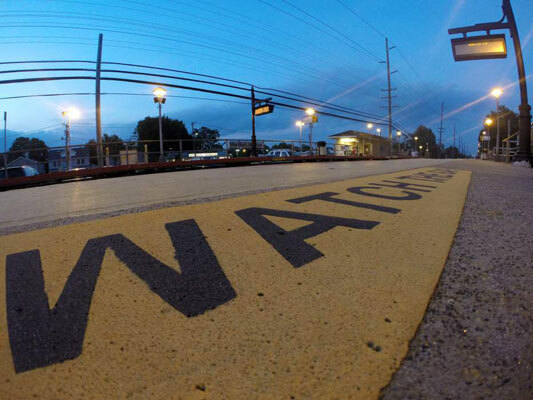 Though the GoPro is only a few inches from this reflective warning on a train platform, the entire picture is in focus.